Keeping up to date with the latest MRI equipment can bust the budget of any institution. An increasing majority of hospitals and clinics are keeping their MRI units longer and imaging departments must make do with existing equipment. Of the approximately 11,000 MRI systems currently in use in the United States, approximately 95% operate 1.5T or less, according to Magnetic-Resonance.org. These still-serviceable units can continue to provide income to a facility and top-tier care to patients using a new generation of flexible imaging coils that bring new functionality to older MRI machines. Containing up to eight channels, these new coils yield increased resolution. In effect, they enable 3T resolution and speeds from 1.5T machines. By virtue of their compliant form, a handful of flexible coils can replace multiple anatomic-specific coils, further establishing themselves as a cost-saving option. Arguably, the top attribute of these new coils is their flexibility. It should come as no surprise that form-fitting pliancy can improve resolution. "The closer a coil's position to the anatomy viewed, the stronger the signal, so a close, flexible fit with the patient's anatomy will improve imaging," says Andreas Melzer, MD, DDS, a trained radiologist and professor of medical technology and founding director of the Institute for Medical Science and Technology (IMSaT), a joint venture of Scotland's Universities of Dundee and St. Andrews, GE Healthcare's first European center of excellence for MRI-guided interventions and surgery. "We've found the open, flexible fitting architecture of [MR Instruments'] DuoFLEX coils provides very high-quality imaging that accommodates views from multiple angles." Minneapolis-based MR Instruments (www.mrinstruments.com) offers replacement coils in two sizes, with an interventional option. The coils are CE marked and FDA approved. MR Instruments was the first third-party supplier to meet criteria for 1.5T GE scanners. A Siemens 1.5T option and 3T multipurpose coils for both manufacturers are currently in development. "If you have an eight-channel MRI and one- or four-channel standard or anatomical coils, buying an eight-channel, multipurpose flexible coil can provide better imaging to meet clinical needs," Melzer says. "The more channels you have, the less noise and more uniform the image typically will be because there are more channels detecting." Flexible, form-fitting coils also permit imaging from angles or views not feasible with rigid coils. This can produce better images that help radiologists make prompt, accurate clinical determinations. Magnetic-Resonance.org broke down the type of MRI scan locations accordingly: 26% of studies are spine, 25% are brain, 11% are upper extremities, 9% are lower extremities, 9% are angiography, 8% are abdomen and pelvis, 6% are head and neck, 2% are chest, 2% are breast, 1% are cardiac, and 1% are other. This mix of coils requires variety and has traditionally forced imaging departments and centers to have five to seven separate rigid, anatomy-specific coils, which can add up to many thousands of dollars. Flexible coils allow fewer coils to do double duty. For instance, a single 10-cm multipurpose, flexible coil can be used to scan a finger, wrist, ankle, patella, or forefoot, as well as a temporomandibular joint, eye orbit, or carotid artery. A single 24-cm coil can cover larger areas like the shoulder, pelvis, knee, or elbow. Multilength straps on these coils leverage the pliability of these flexible coils through an ease of positioning on the patient by radiology techs, and then by maintaining the coils in close approximation to the body part being scanned. "We've found that a flexible coil can supplement or take the place of several rigid, anatomy-specific coils with equal or even better image quality," Melzer says. "Traditional rigid coils, in contrast, are often closed in with a harness, which hinders punctures, thermal ablation, or injecting agents," Melzer adds. "Whereas flexible coils provide greater freedom for MRI-guided interventions for the abdomen, knee, wrist, spine, shoulder, etc." Eliminating coil change-out between scans can save as much as five to 10 minutes of preparation between scans. Over the course of a day, this can increase the number of exams. If an imaging center typically does eight per day, one additional exam could increase daily revenue by 12%. Melzer notes that flexible coils can also improve patient comfort during an exam. "Sometimes there are limitations in patient mobility or pain management that can make our lives difficult," Melzer says. "For instance, a patient may not be able to lie flat on the table in the proper position for a traditional, rigid spine coil. In these cases, you can accommodate the patient with a flexible coil, and scan the spine with the patient lying on his or her side. This is particularly true for younger pediatric patients, for which proper-fitting, rigid coils are hard to find." 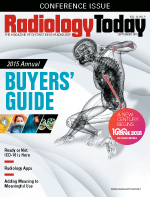 "MRI image quality depends on both coil fit and the patient staying still," Melzer adds. "If the patient moves because he's uncomfortable with the coil, you've got a bad image." Third-party coils can rejuvenate older scanners to provide a similar experience and image quality as new systems and extend the utility of existing radiology assets. — David J. Rizzo, DPM, is a podiatrist, writer, and speaker based in Southern California.